Its Friday, and I’m so happy the weekend is here! In case you missed my week 3 update for the One Room Challenge, check it out here. 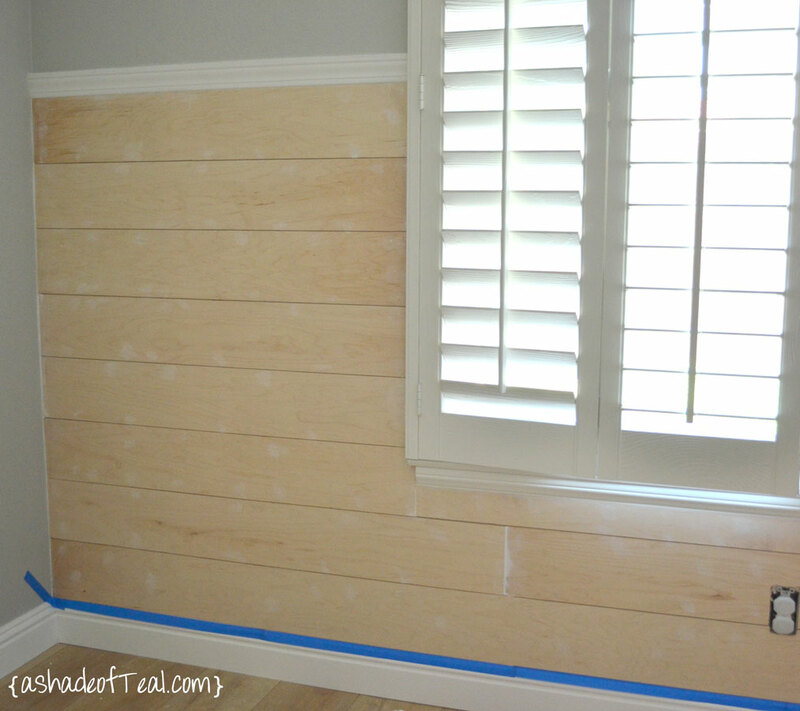 As I mentioned, I started and finished my Shiplap wall! 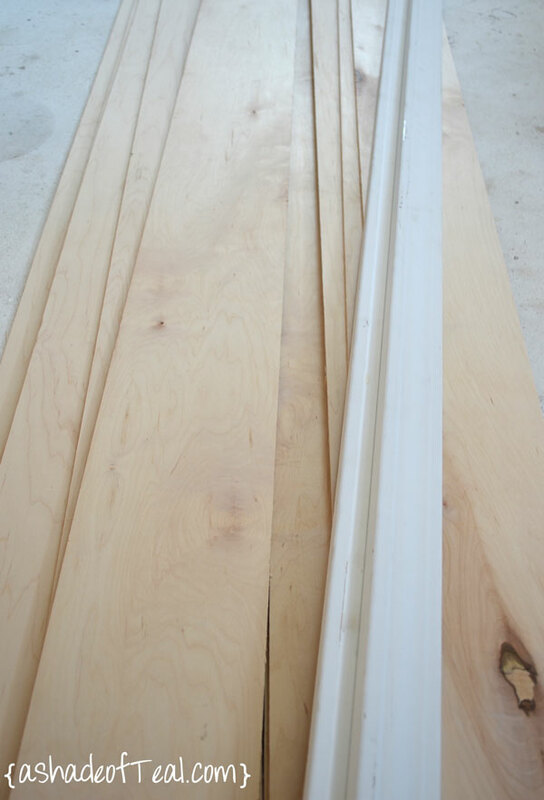 Window or Door Casing 2 1/2” wide, I needed 2 pieces for my room. 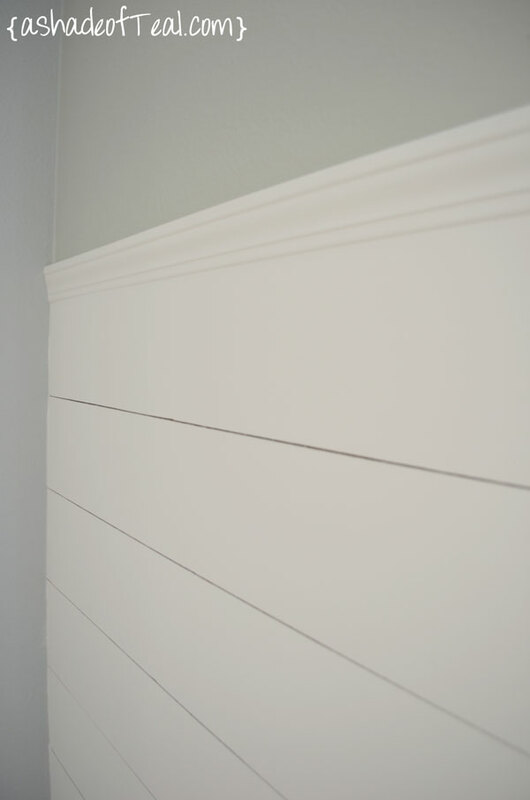 I decided to make a faux shiplap wall rather than a real one because the cost would have been so much more. 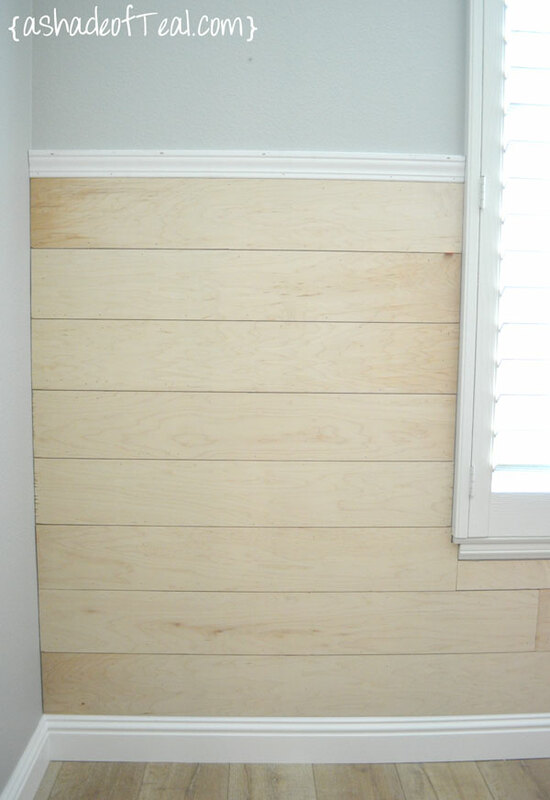 Plus, I didn’t want the paneling to be super thick on this wall. 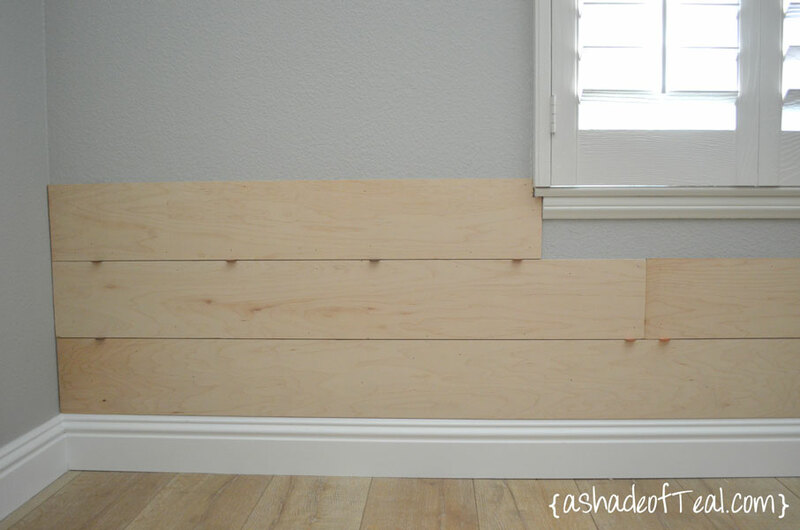 I like the idea of only having a 1/4″ thick panel instead of a 1/2″-3/4″. 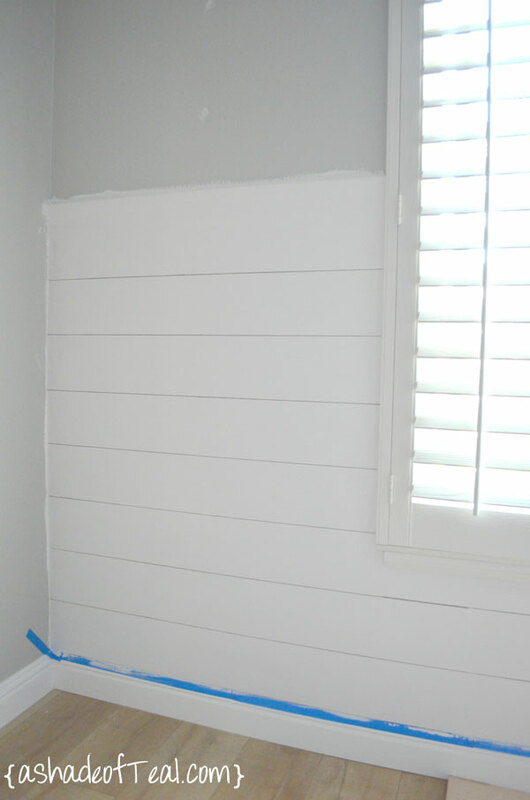 As you can see by my sketch, I only wanted the Shiplap to go up a little over half the wall. I ended up buying 2 large under-layment panels at Lowe’s (about $20 each) and had them rip them into 6″ wide strips. The panels started as 6’x8′ and I was able to get 8 pieces per panel. Here’s the before of my office wall. I left my paint as is since it was a light grey and I figured the color wouldn’t show through. I wasted no time and nailed my 1st piece right above the existing moulding. You can see I only had a minor cut for the outlet. For spacing the panels I used pennies. Moving along, I added the 2nd row. When it came to the 3rd I had the window to deal with. I decided to make it as easy as possible and cut the piece to the edge of the window seal leaving a small open space. I figured it would be easier to cut a small strip rather than doing a detailed cut in 1 long piece. Plus, once I spackle & sanded you wouldn’t even notice a seam was there. I added a piece of moulding to finish both sides off. Here’s the finished wall so far. I almost wanted to keep it as is but I knew once it was painted white I would still love it. Now for the paint prep; spackle the holes, caulk the seams & sanding. I used a white paint I had lying around for furniture. The paint went on pretty easy the only set back was keeping up on removing it in the seams. I used a wooden skewer to clean the paint out as I went. The key is to not let the paint dry in the seam. I ended up doing 2 coats with another round of small touch ups. Once the white paint was dry I was able to touch up the grey paint. That’s it! I broke this project up over the weekend but realistically I could have finished the entire thing in one afternoon. Now the after pictures! I’m in love with the wall. It makes the room feel so much bigger. Make sure to follow along on my One Room Challenge for the entire office reveal. Only 3 more weeks left. Looks great! 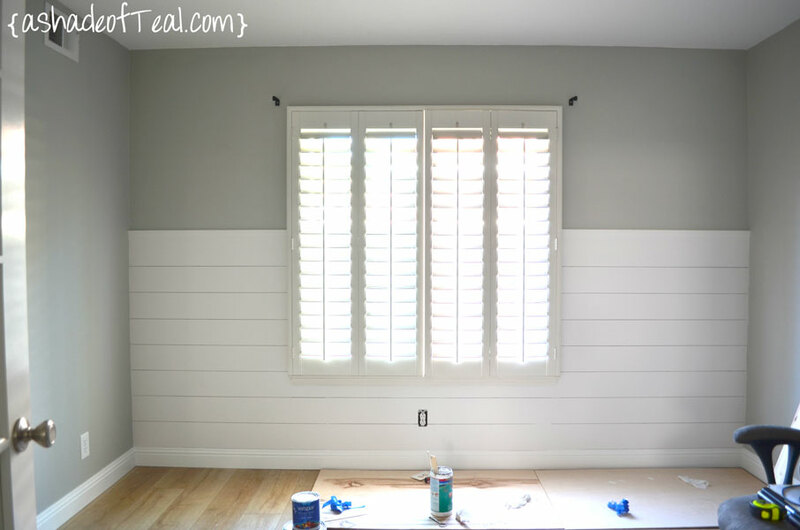 I love how projects like this add some architectural character to otherwise plain walls. We used the same underlayment for an accent wall in our main bathroom. It is primed and waiting for me to paint it the final white. I shared an unpainted picture on fb with the same dilemma- it does look great unpainted too. Thanks Elizabeth, I just checked out your blog! 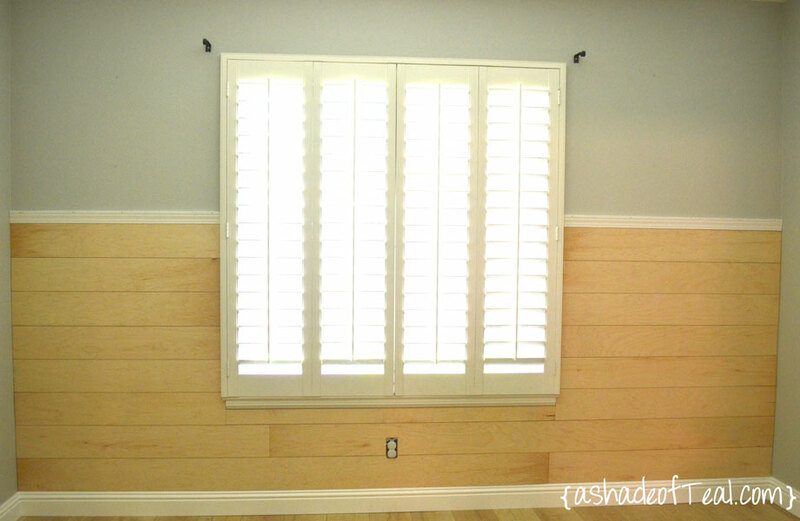 I love the panel walls in your family room! LOVE this. What are your thoughts on painting the boards first then going back and touching them up after install. I think I’d go mad trying not to get it between the boards. I think doing it that way would still work, but you might have more touch up than you think after you patch and sand the nail holes. 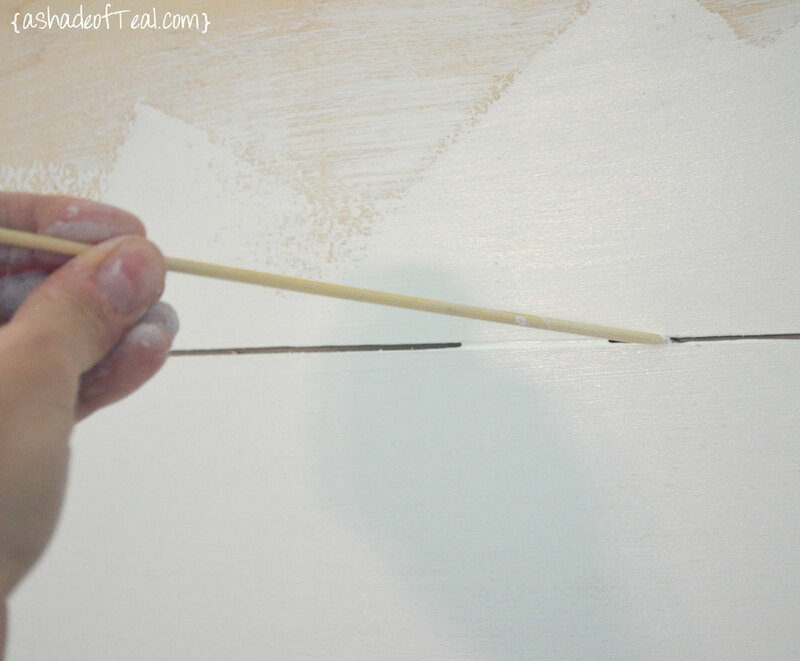 Keeping the paint out of the seams was pretty easy using a toothpick. Let me know if you try it and how it goes! Your room looks beautiful!! We are doing this in our powder room. 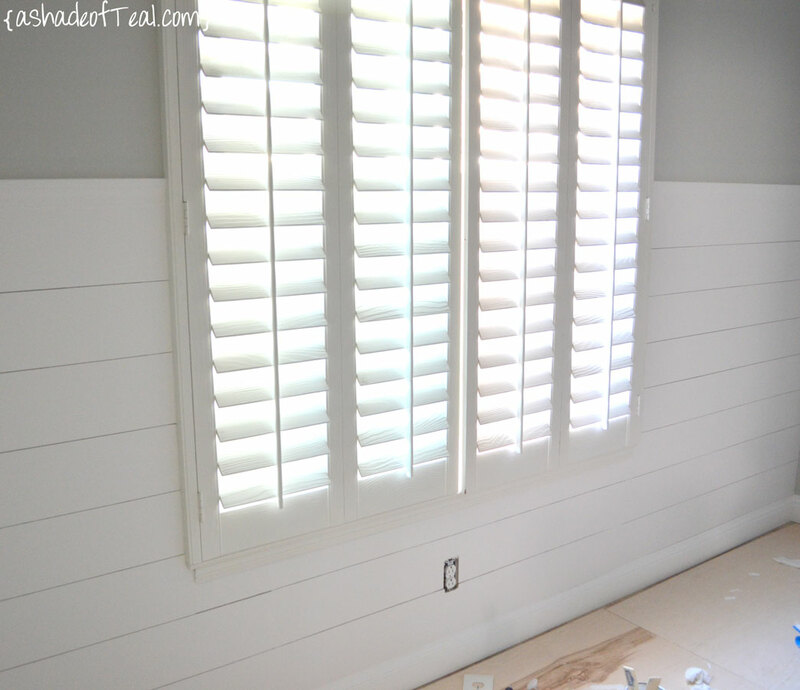 Please tell me how you painted your shiplap, roller or brush? 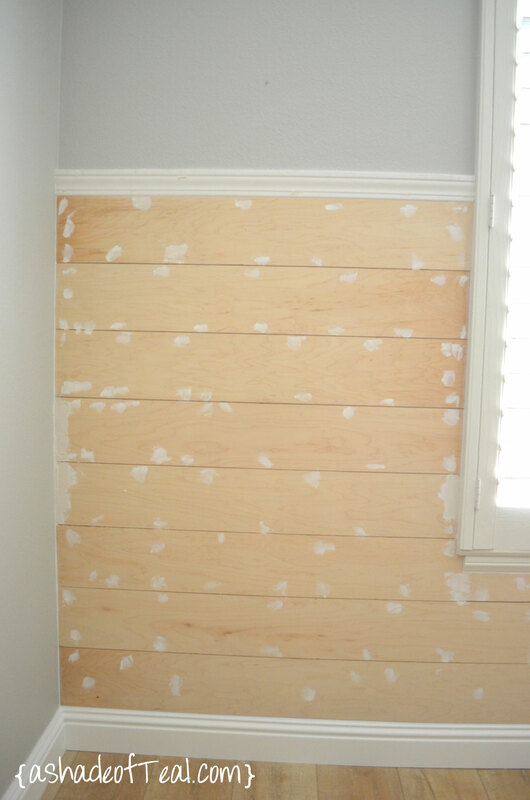 Typically we brush all wood in our house, but I can’t imagine people brush entire rooms filled with shiplap. Would love to have your input. Hi Becky, I rolled the entire thing but then used a brush to remove the roller strokes. I wanted it perfect so I probably spent too much time. 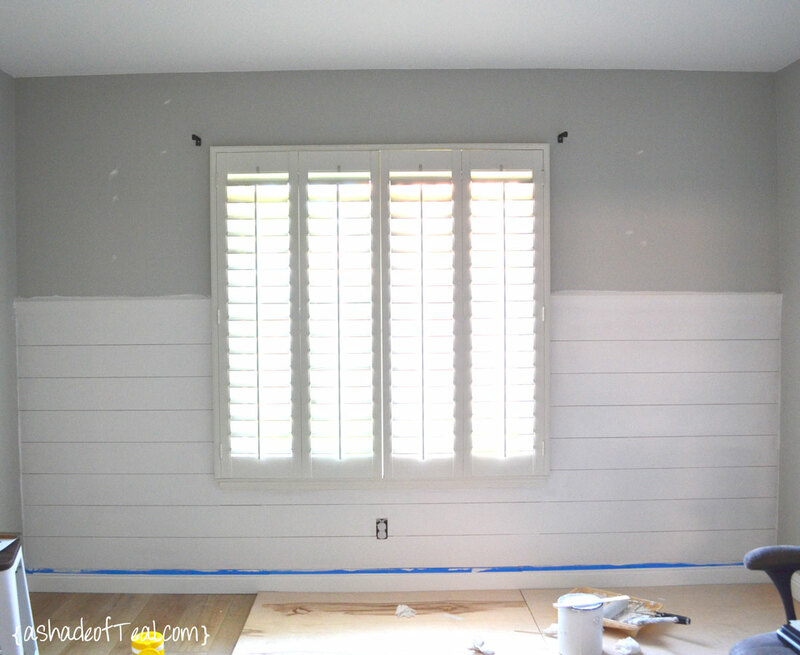 I think you should have painted the piece of moulding at the top a different color than the “shiplap” to set it off. It reads as part of the top plank. Other than that. it looks pretty good. I only cut 6 pieces per board and kept the leftovers for another project. Your wall looks fantastic. 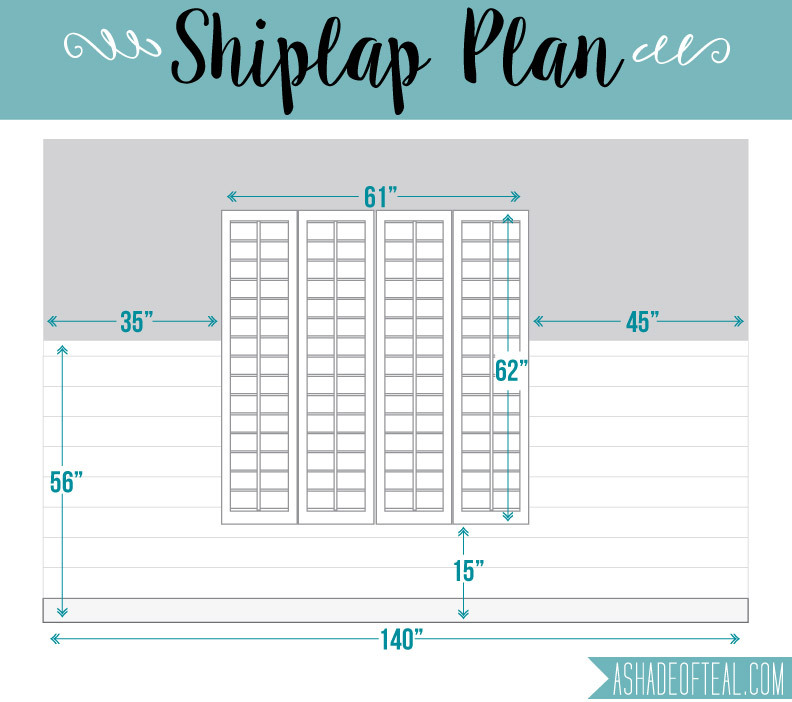 I love ship lap but it’s not in the budget right now. This is a great way to get the same effect without the cost. Thank you for sharing. I love this and this is just the kind of tutorial I have been looking for! Briliant, thanks so much. Looks great! My decor has been coastal/beach chic for years, and the ship lap is exactly the look I needed in my dining area to jazz it up… It is a nice solid and plain wall and I was thinking of following your lead… But I would go up about 5 feet, and put a small ‘shelf’ at the top instead of chair rail molding to hold starfish and seashells. Thanks to you, I am no longer considering hiring someone to do it for me. Can’t wait to get started!! Thanks Barbara-Ann! I’m so glad your your trying the shiplap for yourself. 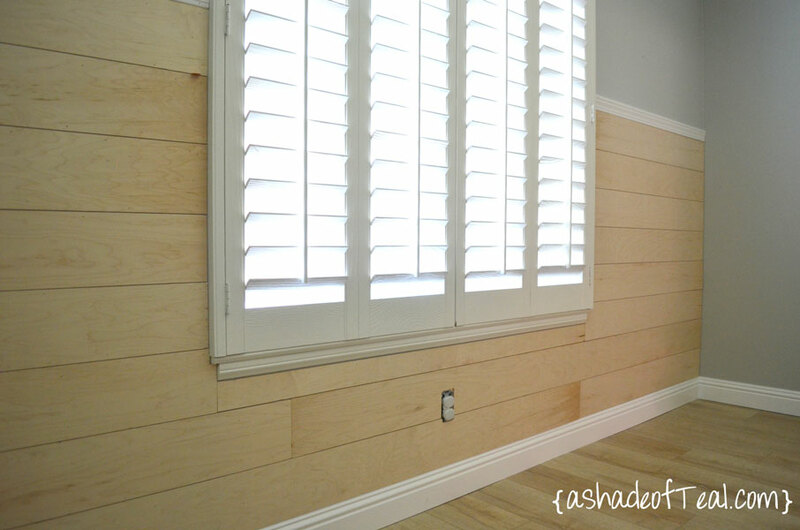 We just finished our guest room in faux shiplap. How exciting! 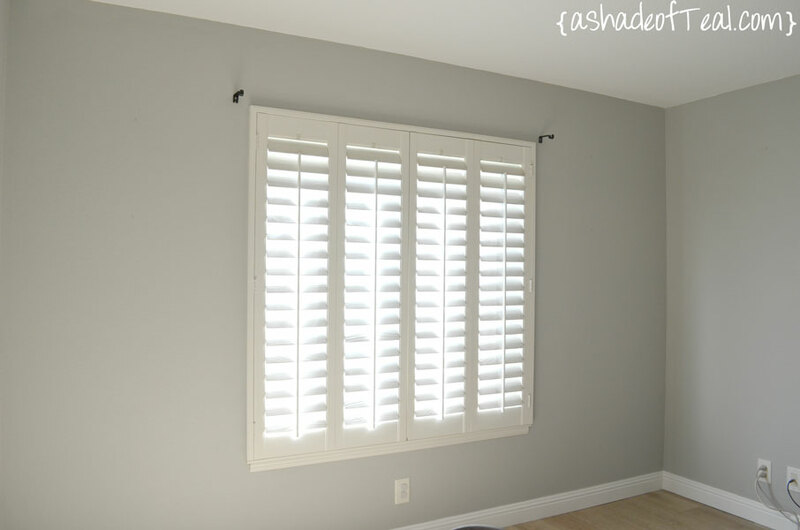 I love how easy it transforms a room. Love this tutorial! Thanks. 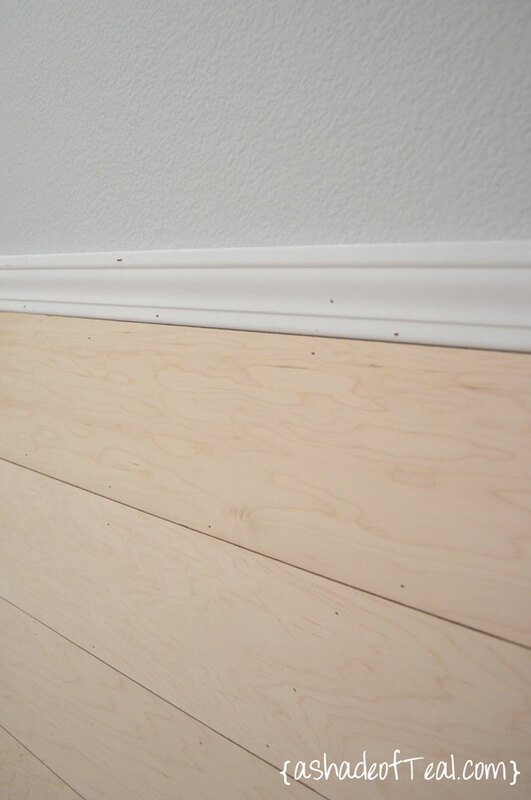 Did you feel the need to use any trim along the edges of the wall or no? 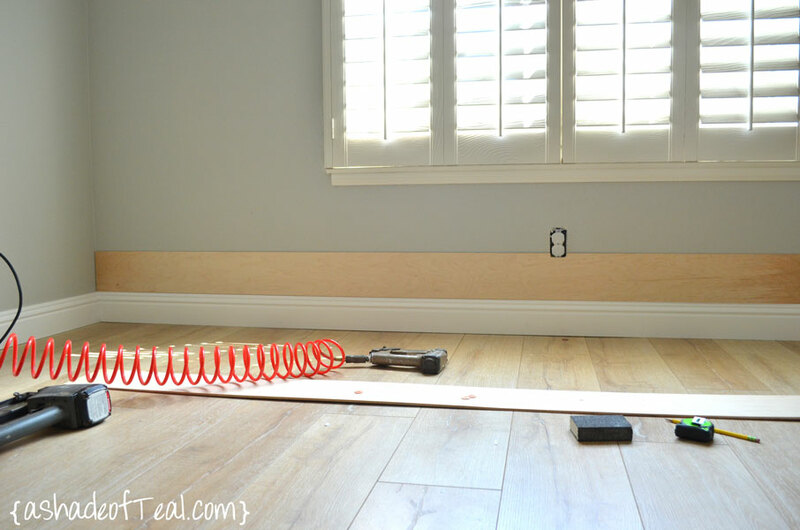 Do the ends of the boards just go right up against the wall? 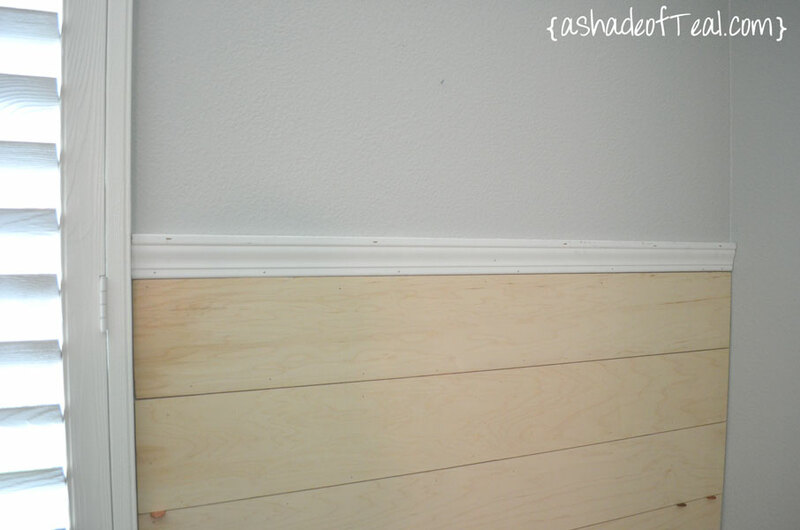 For this room I didn’t add any extra trim since I was able to cut the boards pretty clean to the wall. I also caulked any ends that weren’t perfect and you can’t tell at all. It looks great!! 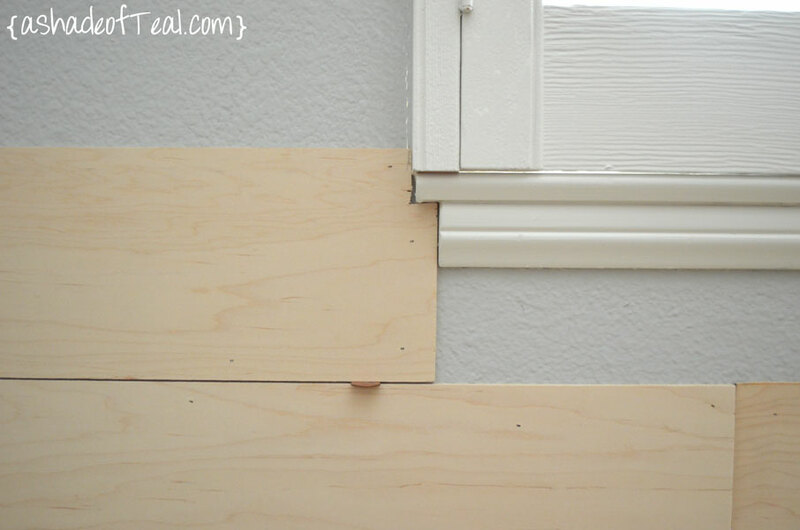 I like the way you did the cut out around the base of window trim, so much easier than cutting the long panels to shape. Have you had any issues with the panels warping/bowing since project was completed and if so how did you resolve? Hi Kelli- I haven’t had any issues with he panels coming off the walls. I think as long as you use long enough nails you shouldn’t have this issue. Thanks! 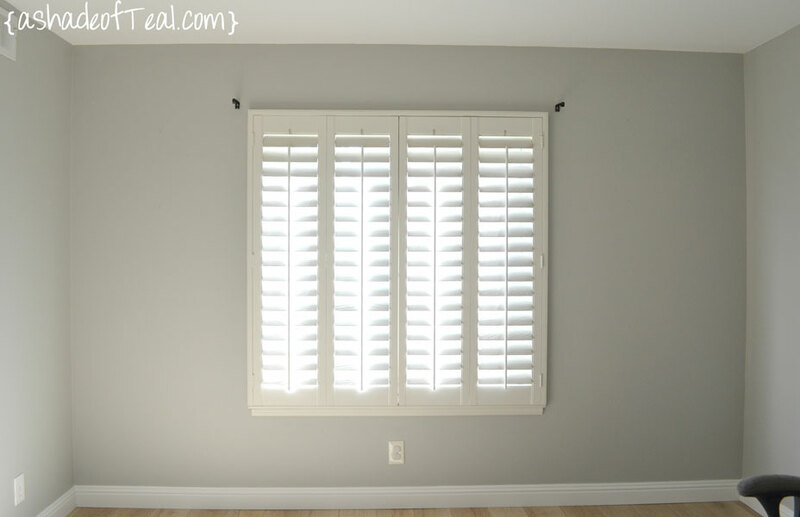 Hi Debbie- They are shutters. They were already installed when we bought our home so I’m not sure where they came from. Sorry to not be much help. Hi Katy, thank you for taking the time to walk us through your project! I love your new wall. I am planning a similar project in the guest bath. I have a question. But before I show my ignorance, I looked on the Lowe’s website for under layment panel and it shows beaded board panels. I don’t think that is what you meant…so, what are you referring to when you say under payment panels? Do you mean 1/4 inch plywood? I want to be sure I purchase the correct materials. Again, thanks for sharing! Hi Terri- Yes it’s essentially 1/4″ thick plywood. My store has it also called out as underlayment. But you can find it in the plywood section. Good luck! What did you use to sketch the draft for the plans? Is that an actual CAD program or? Thanks, wall looks awesome. I use Adobe Illustrator and draw everything by hand. I am really thinking of doing the ship lap to a hall bath. However it has an awful bright green color on plaster walls. Home built in 1900. Should I paint first? Just curious if the paint would show in the cracks. With 12 foot ceilings it’s not my desire to paint first. Hi Phyllis! Unfortunately I think you should. I had bright aqua walls in my nursery and when I held up 2 panels on the wall you could definitely see the blue. A quick coat of white primer should do the trick. It doesn’t need to be perfect but it will help. I did the same thing with our motorhome in slide-out seating area last summer. 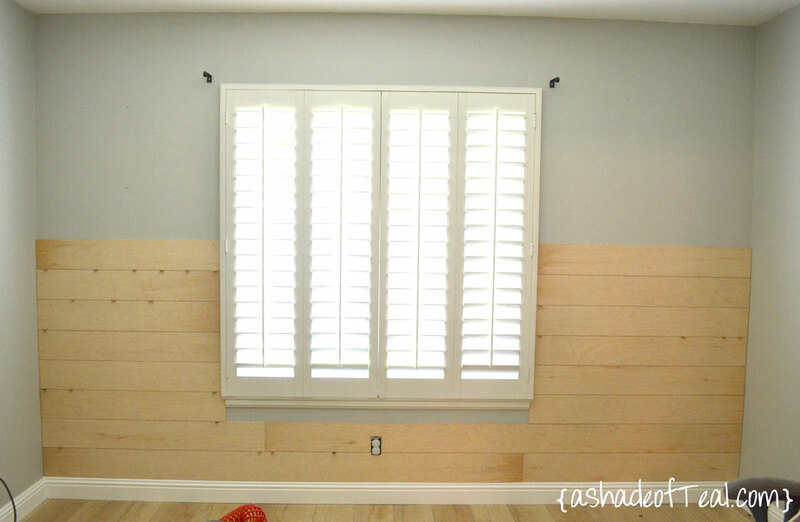 It is inexpensive and work as well as the “real shiplap”! Thanks Cynthia! I’m glad it worked out for you too! Hi! I just did a full wall and thought I was going to die. Dramatic and crunched for time, yes, but looking back what took did you use for your small cuts? This is my biggest issue… around the window and the electrical outlet as well as the smaller strip directly under the window. My job looks very rough compared to the clean look you have here, but I’m praying to use caulk and spackle to do some cosmetic magic. Thanks for your help! I used a table saw to get those perfect cuts. I’m sorry to hear you had a tough time. Yes on caulk & Spackle, it fixes everything! They are Notre Dame by Valspar. Did you outlet plates go back on good or did you have to move the outlet out some ? I had to buy outlet extenders since my screws were too short. Is , how would the plywood looked stained ? It should look fine, but maybe do a test swatch first. Good luck! We did this and I was so happy with it until a week ago I started noticing cracks in the paint. They keep getting worse and popping up in new places. It’s almost like it’s warping a little and bubbles are forming, then popping, but we nailed it thoroughly. Can you give me ideas on what we did wrong and how to fix it without redoing it? Thanks! Maybe the nails you used were not long enough, or possibly you didn’t use enough. 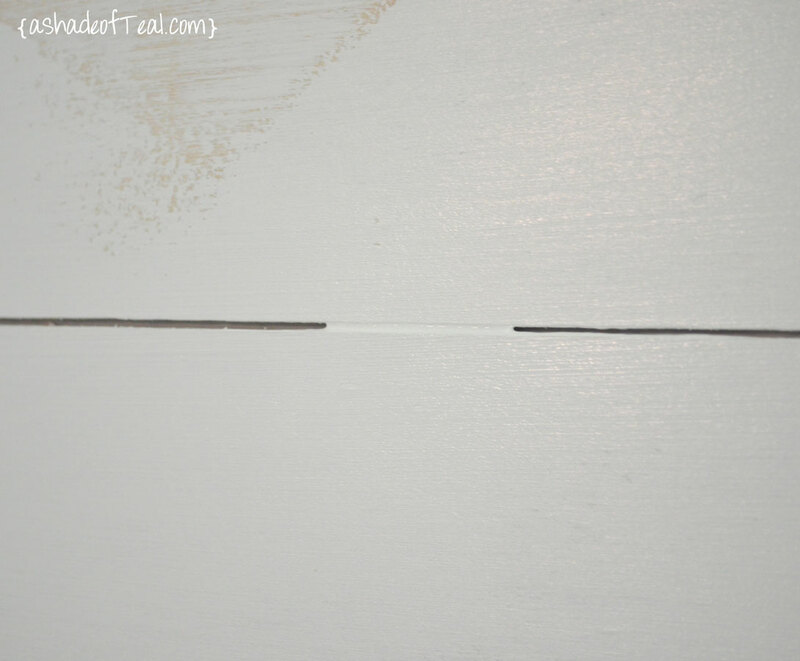 When you caulked along the left and right walls on each side, did you just run a strip all the way down? 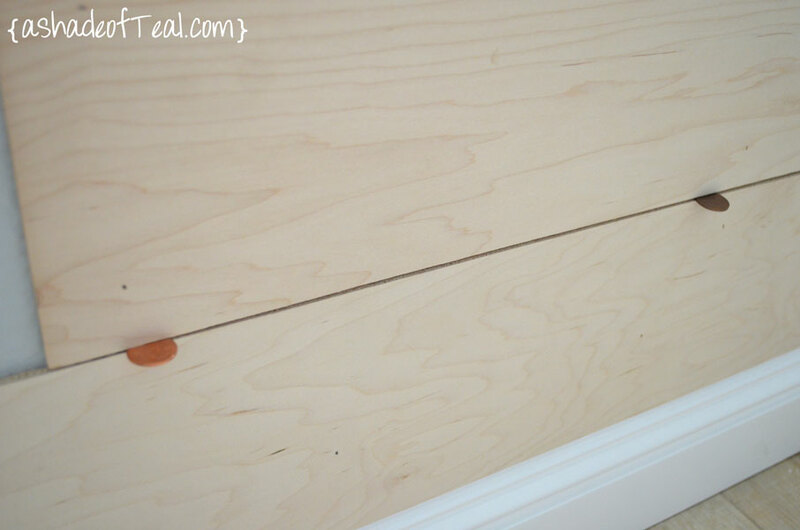 Did you not have to worry about the caulking getting into the tiny cracks (where the pennies create that space)? I’m hoping since it all white, it doesn’t show? When shiplapping the bathroom, what did you do for moisture getting behind the boards. 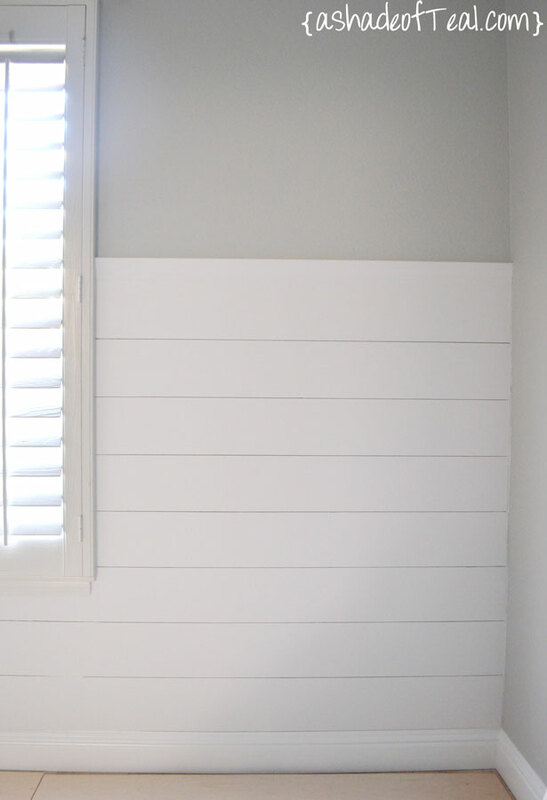 Hi Daphney- Sorry, but I’ve actually never added shiplap in the bathroom, so I’m not sure what you should do. Question: How did you cut you boards from your panel? I’ll be helping a daughter do a wall and they do not have a saw to cut the 6” strips. Help? I had the store do it.